we're still having fun, and we're still the one. Lorton Valley Star provides information which we feel is useful and enlightening to greater Occoquan, Woodbridge and Lorton residents. We try to filter available information for current accuracy, however, we cannot guarantee the information for all sources. The reader accepts that Lorton Valley Star is not liable for loss or inconvenience caused by faulty information, misprints or misunderstanding of our information. In particular, we are not qualified or licensed to provide medical or legal advice and the reader should not construe anything printed in Lorton Valley Star as such advice preferring to seek qualified counsel. We pass along such information from qualified sources, unedited. Check with individual venues for accuracy of events. Lorton Valley Star may from time to time espouse an editorial position in our columns on subjects which should be of concern to greater Lorton residents. If you disagree with anything we have published, we welcome your comment, in e-mail to: nuzguy@LortonValleyStar.com. We’d love to hear from you. Please refer to the issue, page and headline you are responding to. Be civil. Anything you write may be printed as part of a public response. We are Lorton’s one and only home town newspaper serving the greater Lorton community for 16 years. A FREE monthly tabloid picked up from the Fairfax / Franconia Parkway to the Prince William Parkway, Lorton Valley Star covers Occoquan, Woodbridge, Lorton, Mason Neck, Laurel Hill, Newington, Fairfax Station, Landsdowne, Fort Belvoir and Engleside. The goal of Lorton Valley Star has always been to keep trade in our local, predominately rural but, growing community while producing a family friendly publication. This is reflected in our advertising & editorial policies as well as our growth in step with the community. Our stories are not found in the Metropolitan area papers. When selecting news for the print issue, we ask the question that our readers would ask: “What’s in it for me.” The web site www.LortonValleyStar.com covers a little larger area, displays more current news and has links to advertisers own web sites. Press releases are received in e-mail to EICbox@LortonValleyStar.com as well as advertising requests and events for the calendar. Print issue deadline is generally the twentieth of the month. Please check out our web site at http://LortonValleyStar.com. Support Lorton Valley Star and patronize Lorton Merchants. After 16 years we’re still having fun and we’re still the one. 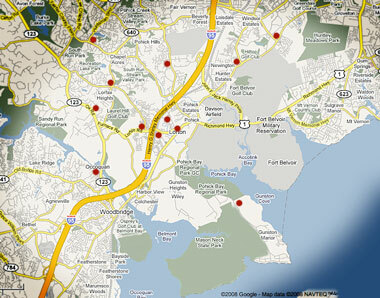 Our coverage area includes parts of Southern Fairfax County. South Alexandria, South Springfield, Mason Neck and Fairfax Station up to the Franconia Parkway. It also includes Occoquan, parts of Woodbridge, and Lake Ridge in Eastern Prince William County down to the Prince William Parkway. It does not include Arlington, Manassas or Fredericksburg. Lorton Valley Star is a community service and hopes to be the bookmark for all of the greater Lorton Area. If you know of interesting, useful websites pertaining to the Rt.1 & Ox Road corridors, and Mason Neck, please point us to them. Beyond being the greater Lorton, Mason Neck, Occoquan newspaper, we try to envolve the residents by providing information about how they can participate with their neighbors for the betterment of the cmmunity. Our mission is to provide a family friendly alternative to smutty publications so that you won’t be afraid to leave it around for your children to read. We do not participate in the normalization of violence, tobacco, obscenity, profanity, or distortion of Christian holidays. This affects or advertisements and our art reviews. Forms are being added to assist in the input of calendar Events, press releases, Feedback to the publisher, and advertising applications.The first group of links on the left navigation column are available by the next section button in a looped sequence. The Tour is also a loop. All pages as well as the second group in the navigation column are accessible directly from any other page. The Lorton VA site is a reference for more or less fixed information about greater Lorton home of American Liberty.